Living in a connected world where information is accessible 24/7 and shared by everyone through social networks means you’ve gotta spend more money on your product to make sure you’re on top of the competition. 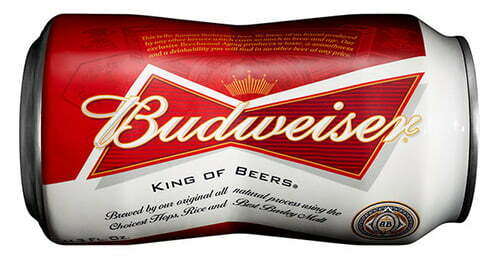 In all its simplicity I think this new Budweiser can shows what it’s all about. At first glance a 10° change doesn’t seem that much. But those 10° makes Budweiser unique and it will not only make a Budweiser can look different it will make you feel the difference. This new bottle will save a fortune for Budweiser when it comes to communication activities and on top of that It’s pretty darn cool in all its simplicity. What’s even more impressive is the fact that this tiny change in shape means a HUGE change in how Budweiser actually produces the cans. They started developing this new can in 2010 and finally it will hit the stores on the 6th of may. Someone at Budweiser took a bold decision. “Let us spend millions and millions to change something today that will have an effect on our future”. Risking your job will lead to success! Previous articleDesign and creativity sells. Have a look at Miss Ko if you don’t believe me. Next articleCase: The Marginalen and Fredrik ‘Benke’ Rydman story continues. Yes, i agree on everything BUT… While they were at it, why didn’t they make a change that had an environmentally aspect as well? Instead of sticking to a material like aluminum that consumes huge amounts of energy and adds a mettalic flavour to the beer. Doing this and not connect it to a purpouse leaves the field open for the competition to follow and excell. Agree on that. I think that’s a bigger challenge as it’s not Bud’s decision to change the way the society handles aluminum. BUT maybe they could if they wanted to. On the negative side we can also ad the fact that the new shape requires more aluminium to be able to handle the 10° angle. The company that creates an eco can and then presents it for the industry as an open standard, they would make me a fan for life. Hey! CCC!! It’s up for grabs!!! I once tried to change a cigarette box for Swedish Match – the idea was that it should include the matches… Swedish Match though it was a great idea but could not afford it. They needed to change the whole carton box factory line just to implement this little change. Might be the same for Budweiser – this is a radical change of design in terms of production, not to much not to less, and smart as it does not effect the the filling production. Indeed, innovation in the future is essential.